Fill out this form to request funds from either your company or an outside firm looking to sponsor your team. It's a great way to pay your team fees or promote your firm. To schedule an onsite presentation on the benefits of company sponsored teams & corporate programs with Club Sport email us here! Club Sport has always been a proven leader in providing fun filled, year-round events. Now get your company involved & your employees motivated. Specializing in organizing events for company picnics, team building, or corporate outings. We have over 10 years of event planning experience and can run almost any kind of corporate sporting event. Get a quote today at www.TBCSevents.com. Teambuilding through weekly sports leagues!! Our leagues are a wonderful tool to bring employees together through athletic activities. Play once a week in a well run, professional sports league and reap the benefits. Employee retention, happier workers, teambuilding, camaraderie, and corporate pride are just a few of the perks from entering your company team today. Talk to your Human Resources Director or company management to see if your company would be interested in fielding a team or sponsoring your current team. You don't have to use our Company Sponsored team program just for teambuilding! If you are a company, such as a bar or restaurant, looking for exposure this is for you. Or if you have an existing team and want to approach a company to sponsor your team, fill out this form! Join the adult leagues local companies are raving about!! Get your company involved in the Sarasota area's best adult sports leagues. Soco Club Sport organizes and runs a huge variety of sports leagues throughout the bay area. Dozens of local companies such as Raymond James, Jabil, America II, Nielsen Media, Lincare, Bright House, and more use Club Sport leagues to let employees unwind and stay active. 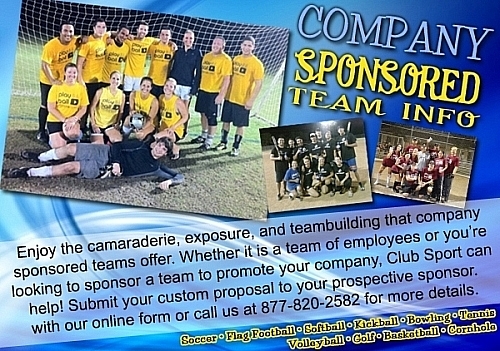 We have openings now in all our leagues for new corporate teams, so call today!! Also inquire about sponsorship and advertising opportunities to reach our young, active, professional audience. Get more info on sponsorship here.